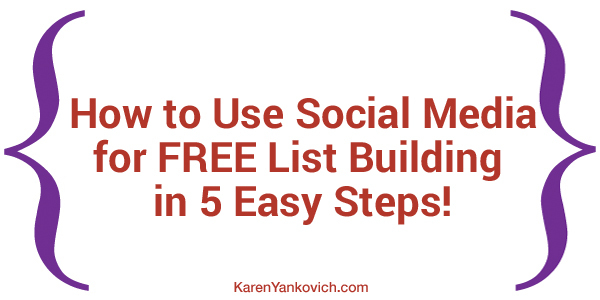 How to Use Social Media for FREE List Building in 5 Easy Steps! Whenever I put extra focus on list building, my business profits grow. That’s because the old adage is true: it takes approximately 7 “touches” for someone to buy from you. I don’t know who said that but they were right! For my prospects who aren’t super “warm” to begin with, meaning they didn’t know they were in the market for LinkedUp Success or decided to sign up to my list because they know they should focus more on social media, the 7 touches theory is fairly spot on. These future clients (and they most definitely are future clients) are in the info-gathering, researching, learning to to trust phase of the buy. And it is in this space where all the magic happens. There are many paid ways to grow your list, such as Facebook ads. I believe Facebook ads are well worth the money for list building. But sometimes we just need something that is free am I right? And using social media to grow your list is FREE. Free ways social media helps you build your list. Today let’s focus on all the free ways social media helps you build your list, because, let’s be real here, I know we’d all like to save a buck or two when it comes to the overhead costs of running our own business and finding new clients. Why yes, yes we would. First things first, you must send these future clients to a squeeze page or in other words a landing page. Don’t send them to your home page. Make sure these prospects are headed to a page where they have two choices and two choices only – to enter their name and email to gain access to choice a)a webinar or free valuable info download or choice b) click away. We don’t want to give them other tabs to peruse, nothing else to read, no social media icons or other buttons to click, just give them you, a brief yet enticing description of what and why they need what you are offering, and the opt-in box. Yes, you can also grab this from my home page, but for social media purposes, you want to drive traffic to a specific page for best results. And, Marketing Sherpa reports that “64% of marketers say that landing pages are the most effective way to test a value proposition.” And they are right. I have seen it myself, and I wouldn’t market through social media any other way. So now you have your landing page created based on an info product or service that you specialize in there’s only a few more steps to take and you will be marketing yourself for free across all of your social media. Next I want you to take that landing page link and place it in the summary section on all of your social media sites. Here’s an example of my Facebook page. You will be taken to my landing page by clicking on the Sign Up button in my header. On my Twitter page the link in my summary takes you to a landing page for a free video series. Take a look at my Pinterest account. On the Free Stuff board you can find the link to my landing page to sign up for my free E-Book. I have 3 separate landing pages in my LinkedIn summary, to capture the right topic that is best suited to the reader, take a look here. Tweet a few times a day with a link in the tweet to that specific landing page. Post that link to Facebook a few times a week. Use it in your call to action on a LinkedIn Post once a week. Add that link to a Pinterest Post once a week. And finally talk about it, type it in the chat screen, and make darn sure it is in your summary every single time you live-stream! That’s it folks, simple yet effective list building that is entirely FREE via social media. Have a question about what to say when you post,tweet, chat about your landing page link? Join my LinkedIn Group where myself and many other interested entrepreneurs would be glad to answer your question!